WII FIT PLUS - WII. THE BORING BITS. We've all heard the complaints of Wii Tennis Elbow by now, and more than a few of us have found ourselves embarrassingly out of breath after a session on Wii Sports Boxing. Yes, the Balance Board. A new peripheral, the Balance Board is set on the floor and stood upon. New listingNintendo Wii Game - Wii Fit.3+No Manual. 4.5 out of 5 stars - Nintendo Wii Game - Wii Fit.3+No Manual. 21 product ratings21 product ratings - Nintendo Wii Game - Wii Fit.3+No Manual. ZUMBA FITNESS. NINTENDO WII / WII U. PLAY WITH UP TO 3 FRIENDS FOR THE ULTIMATE FITNESS DANCE OFF. 1 x Zumba Fitness Disc. 1 x Fitness Belt. 1 x Instruction Booklet. As you can see from the picture, it is in good condition however the box is a little tatty. What you see in the picture is what you get. Follow along as celebrity Zumba instructors Tanya Beardsley, Gina Grant and Beto guide you through each routine. Choose each instructor's outfit and personalize clothing with the new Zumba apparel customization feature. Nintendo Wii. Nintendo Wii U. The item is fully functional. Playstation Vita. It will Not work on USA or NTSC Consoles. This will work on all EU PAL Consoles. Item Compatibility. Item Location: Yorkshire, United Kingdom. Challenges include Push-Up Challenge, Plank Challenge and Jackknife Challenge. The primary tenet of Wii Fit is balance. Your centre of balance, the point between your left and right sides when you stand upright, has a lot to do with your health. Success in Numbers! Train with a friend and compete in weekly challenges to see who really is The Biggest Loser. -Fitness Toolbox! Add in The Biggest Loser resistance bands or Stability Ball to enhance your workout or use the Wii Balance BoardTM for Squats, Knee Lifts and Lunges. THE DVD ,CASE AND BELT ARE LIKE NEW. Nintendo Wii / Wii U. Step to the Beat. German (DE) Version. Used - Very Good Condition. It is used and is c omplete with manual, in very good condition. Dispatch and Handling. Region: PAL. Need to get in touch?. The Biggest Loser Challenge - Nintendo Wii. Disc, case and manual all in nice condition. Tested and working. ZUMBA FITNESS CORE. Zumba® Fitness Core. New featured artists include Enrique Iglesias, LMFAO, Shakira, Bob Marley and more! Tutorial: Learn at your own pace by breaking down the six core dance styles into the basics. In very good condition complete with box and wii fit plus booklet and wii balance board booklet. For PAL Format Nintendo Wii and will also work on the Wii U using original Wii Remotes (if required). New & Sealed. These will not work on standard US CAN JAP consoles. Your Shape inc Motion Tracking Camera (slight damage to box) - Wii UK Sealed! Factory Sealed! Contents flawless, never removed from box. Official UK Release. 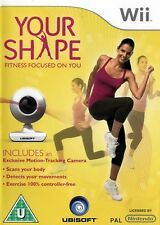 2.5 out of 5 stars - Your Shape inc Motion Tracking Camera (slight damage to box) - Wii UK Sealed! 2 product ratings2 product ratings - Your Shape inc Motion Tracking Camera (slight damage to box) - Wii UK Sealed! The Biggest Loser (USA Version). Boxed with Instructions PAL. Original UK version, complete with case, covers and instructions. -PERSONALISED FITNESS Create your profile and choose your objective. -DEVELOPED WITH PROFESSIONALS Workouts developed with the help of experienced fitness professionals to insure precision and effectiveness. The Biggest Loser Challenge Nintendo Wii "FREE UK P&P"
THE BIGGEST LOSER CHALLENGE FOR THE NINTENDO Wii. Compatible with the Wii balance board (not included). These are available as an option at checkout. The case, disc and manual are all in very good condition. 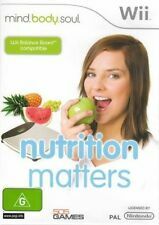 4.5 out of 5 stars - The Biggest Loser Challenge Nintendo Wii "FREE UK P&P"
2 product ratings2 product ratings - The Biggest Loser Challenge Nintendo Wii "FREE UK P&P"
The Biggest Loser Challenge. Nintendo Wii / Wii U. Your Shape (Game Only) Wii (Nintendo Wii) - Free Postage - UK Seller v.g.c. 2.5 out of 5 stars - Your Shape (Game Only) Wii (Nintendo Wii) - Free Postage - UK Seller v.g.c. 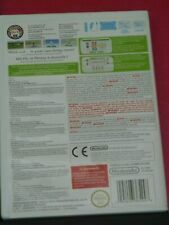 2 product ratings2 product ratings - Your Shape (Game Only) Wii (Nintendo Wii) - Free Postage - UK Seller v.g.c. Mind, Body & Soul's Nutrition Matters is perfect if you're looking for a fun way to maintain a healthy balance between diet and exercise in the comfort of your own living room. Mind, Body & Soul Nutrition Matters. 1 x Zumba Fitness Belt. 1 xZumba Fitness 2 Disc. 1 x Instruction Booklet. What you see in the picture is what you get. ZUMBA FITNESS CORE with FITNESS BELT. Complete with Zumba Fitness Belt & Manual. Nintendo Wii workout. Compatible With Nintendo Wii & Wii U PAL. Wii Fit Plus. Fully Tested. Cleaned & Tested - In Full Working Order. thoroughly tested. Bookmark Us. 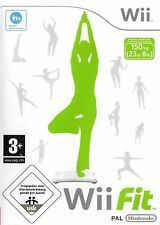 Wii Fit Nintendo Wii (NM) "FREE UK P&P"
Wii FIT FOR THE NINTENDO Wii. make Supersized seem small. The disc is in good condition with minor usage marks. The balance board is not included. These are available as an option at checkout. 4.5 out of 5 stars - Wii Fit Nintendo Wii (NM) "FREE UK P&P"
21 product ratings21 product ratings - Wii Fit Nintendo Wii (NM) "FREE UK P&P"
It was developed with the help of experienced fitness professionals to ensure every move is precise and effective. MY FITNESS COACH. NINTENDO UK ORIGINAL. Developed With Professionals - Workouts developed with the help of experienced fitness professionals to insure precision and effectiveness.